...The Serbs began to "march girls and young women away from the group of refugees. They were raped." ....A Dutch soldier stood by and watched as the women were raped, even listening to music on his Walkman.... A Serb, says Subasic, "told the mother to make the child stop crying. But when the baby continued to cry, he took it from the mother and slit its throat. Then he laughed. A Dutch soldier also witnessed the murder of the baby, she says, and yet he "didn't react at all"... The Muslim men, some as young as 12, were almost all murdered. The scenes that transpired in the camp are indescribable. The Serbs would pick out girls from groups. "I saw the Bosnian women begging the Dutchbat soldiers to bring the girls back," Kadira Gabeljic, one of the plaintiffs, recalls. But they only responded: "no, no, no." Ramiza Gurdic, another plaintiff, witnessed an incident that she is unlikely to ever forget. She describes a scene in which a 10-year-old boy was placed in his mother's lap and literally slaughtered. "His little head was chopped off, and the body remained in the mother's lap." 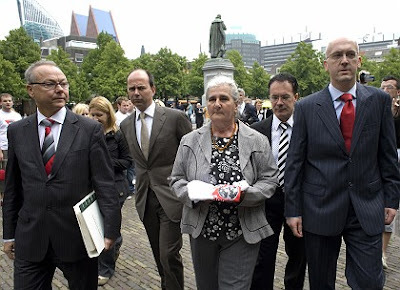 Dutch lawyers Axel Hagedorn and Marco Gerritsen, a "Mother of Srebrenica" Maunira Subasic, and lawyers Faruli Capina and Semir Guzin on their way to deliver a civil summons at the Dutch Supreme Court in the Hague, the Netherlands on Monday. The suit alleges that although the Serbs' murderous intentions were known, neither the Dutch, as a protective power, nor the UN, as the organization providing the mandate, took steps to save the local population. The attorneys are demanding €25,000 in initial damages for each plaintiff, as well as overall damages that have yet to be determined, for what they call the "worst genocide since World War II." The refugee camp in Potocari accepted only one in six of about 30,000 Bosnians seeking shelter there. The rest were forced to stay outside the camp. 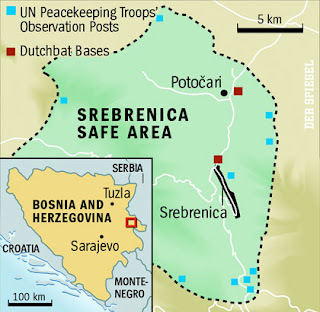 The situation became critical on July 12, when Serbs standing at the gate demanded to be allowed in to inspect the camp. The Dutchbat troops agreed. To avoid provocations, the UN peacekeepers laid down their weapons and placed them on a pile. When the Serbs began marauding through the camp, the Dutch soldiers simply looked the other way. After returning home, a Dutch soldier later said that he preferred to forget what he experienced on that day: "torture, executions and slaughter." Instead of preventing the crimes or at least reporting them to the UN command in Sarajevo, the Dutch are even accused of having actively participated in the selection of Bosnian women and men. The Muslim men, some as young as 12, were almost all murdered. The scenes that transpired in the camp are indescribable. The Serbs would pick out girls from groups. "I saw the Bosnian women begging the Dutchbat soldiers to bring the girls back," Kadira Gabeljic, one of the plaintiffs, recalls. But they only responded: "no, no, no." Ramiza Gurdic, another plaintiff, witnessed an incident that she is unlikely to ever forget. She describes a scene in which a 10-year-old boy was placed in his mother's lap and literally slaughtered. "His little head was chopped off, and the body remained in the mother's lap." The prosecutors are convinced that the Dutch soldiers were criminally negligent when it came to fulfilling their duty to secure the UN-protected zone. As a result, the suit alleges, they "handed over the population to the bloodthirsty Bosnian Serbs." The suit has gained impetus from a decision handed down in February by the International Court of Justice, under which states are obligated "to prevent genocide." The Dutch state played a "controlling role" in the UN peacekeeping mission, says attorney Hagedorn, "and for that reason it must now be held liable for the dramatic consequences." The fact that the Amsterdam attorneys are also taking aim at the United Nations is even more relevant for international law. The UN generally enjoys immunity so that it can fulfill its goals. But, the plaintiffs say, that immunity can no longer apply in this case. According to the plaintiffs, the UN approved the Bosnian mission in a number of resolutions and executed it with the help of UN peacekeepers. It would be an unacceptable "concentration of power," says Hagedorn, "if it cannot even be monitored by the courts anymore." Even more important, say the plaintiffs' attorneys, is the fact that the UN's immunity was established so that it could pursue its humanitarian goals worldwide. But, says Hagedorn, he cannot imagine "that the UN sees genocide as part of its purpose." Translated from the German by Chris Sultan. 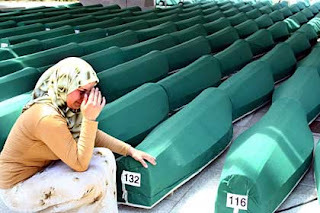 Republished from Der Spiegel, June 05, 2007: Srebrenica Survivors Sue Netherlands, United Nations. For Fair Use Only [Educational / Non-Commercial].